In 1829, Mexico abolished slavery, threatening the power of slaveholders who wanted to expand the territory in which slaves could be legally held. For the next two decades a battle would be fought over the status of Texas. 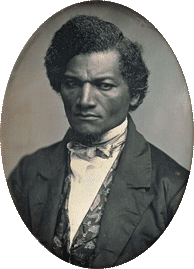 In a speech in Belfast, Ireland, in 1846, the fiery abolitionist Frederick Douglass described the U.S. annexation of Texas as a "conspiracy from beginning to end—a most deep and skillfully devised conspiracy—for the purpose of upholding and sustaining one of the darkest and foulest crimes ever committed by man." In this speech1, delivered in Boston in 1849, Douglass, speaking to other abolitionists, calls for forcible resistance against the invasion of Mexico—and against slave owners in the South. 1 Frederick Douglass, Address to the New England Convention (May 31, 1849). Speech delivered at the New England Convention in Faneuil Hall Boston. Massachusetts. Printed in "Great Meeting at Faneuil Hall," The Liberator (Boston, Massachusetts), vol. 29, no. 23 (Whole no. 961), p. 90.